Purchased in 1971 by George’s dad this boat has been on the Potomaic River, the Tennessee River, the Mississippi River as well as other destinations through out the south east. She spent the majority of the 1980s cruising Pickwick Lake in Tennessee. In 1995 she was parked in a barn until she was pulled out for restoration in 2013. Currently she is being completed gutted with all of the structural wood being replaced as well as several fiberglass issues slated to be repaired. Name: WAVES (in honor of W.omen A.ccepted into V.oluntary E.mergency S.ervice. Women of the U.S. Navy in World War II). Higgins was known for its landing craft and other military boats during the war years. Powered by a Ford/Crusader 390 cubic inch motor. Straight inboard. It is pictured on Priest Lake in Idaho at pre-events to 2013 ACBS Show and Mtg. John and Carolynn Thompson were at least the third owners of this boat. 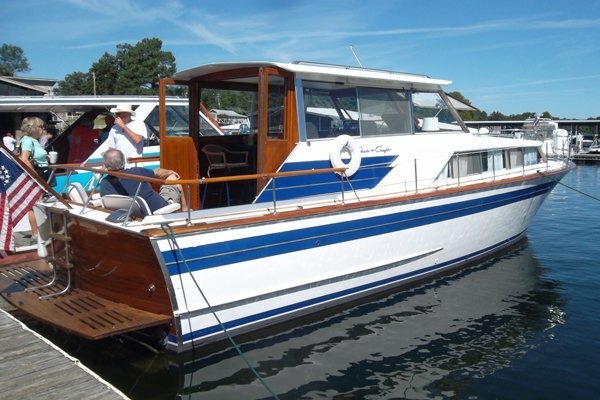 They put in a new plywood bottom, new mahogany decks and transom, beefed up the superstructure of the boat, and mahogany flooring. It has second-generation upholstery and the original motor. The top shown is new, but listed as an option in the 1961 brochure. 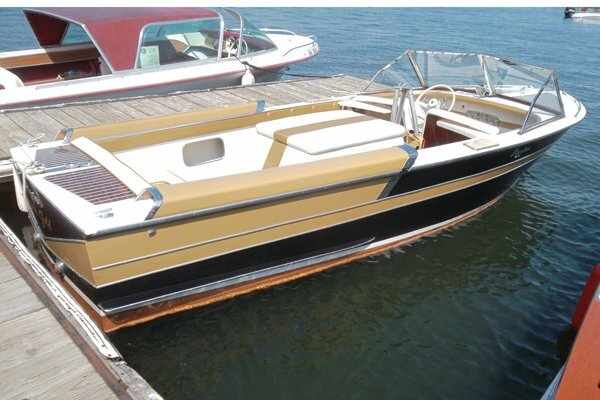 The boat was purchased in 2018 by Michael and Tracey Karst. Wheaties (the Sabre) was found advertised in the Kansas City newspaper about 1986 – 87. Some guy’s wife was trying to sell it for her husband’s bail money. 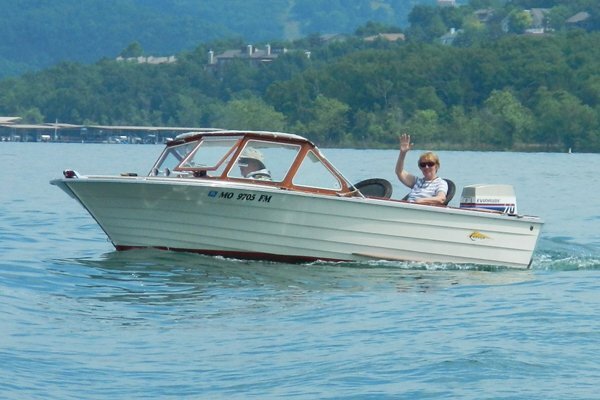 The boat was originally sold in 1962 by Link’s Landing (one of the largest Century dealers in the country at that time) located on Lake of the Ozarks. It had sat in a pole barn where the horses could get in and crib on the gunnels. Usually one of the last pieces of wood to rot in a wood boat are the engine stringers; however I had to replace the port side and the back half of the starboard side. The original Gray Marine engine was an American Motors 327 (238 H.P.) and a good engine. Working under the idea that bigger is always better, I found a Gray Marine Buick (280 H.P.) and squeezed it in. Not much passenger room, but fast and fun. The name Wheaties suits it well. Our granddaughter was the first to ski behind her. 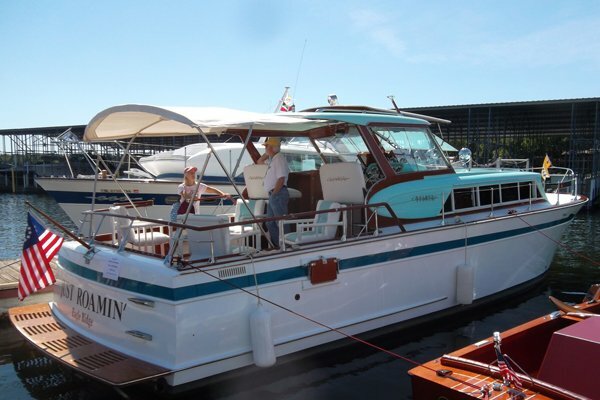 The boat was finished for the 2007 Grand Lake Boat Show and has been a great little boat for us. We are the third owners of this boat. We purchased her in 2002 from the second owner who was a friend of the first owners. Originally it was Gray and white and named Gray Gull. It mostly was used on Lake Leelanau near Grand Traverse Bay of Lake Michigan and Grand Traverse Bay in northern Michigan. Champagne Taste was delivered to a Mr. Sluiter in Seabrook, New York near the end of 1964. Ten years later it was transported to Ft. Lauderdale, Florida to Roger Morton where I found it in rough condition at Shirt Tail Charley’s Marina. 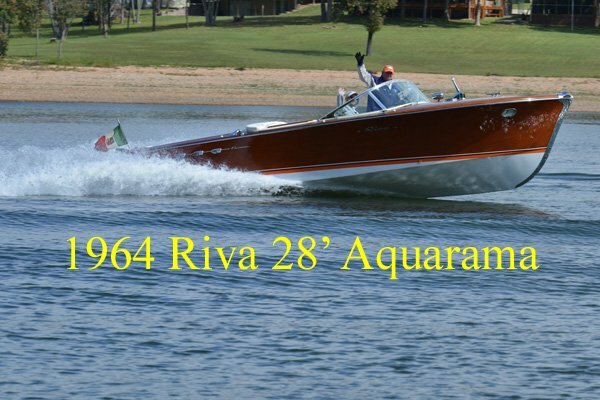 A Riva Aquarama is a continuous plank, all-mahogany, constructed boat. It is powered by two Chevy 283ci 185 hp V8 engines. 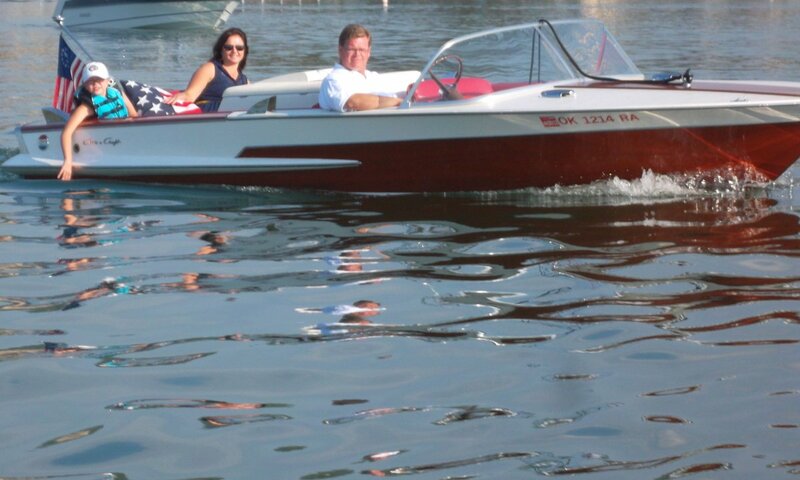 Since owning the Riva, I have personally fully restored the entire vessel, except for the upholstery. This has consisted of replacing the bottom, fore and aft decks; stripping, staining and varnishing the boat with a total of fifteen coats; and overhauling both engines and transmissions. 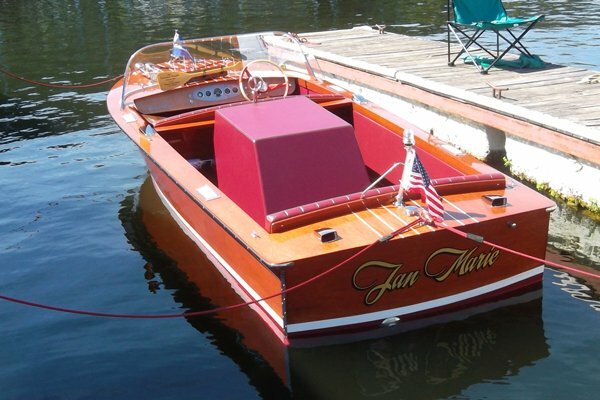 The boat’s name, Champagne Taste, is symbolic for me as I, along with my family, am in the wholesale liquor business and all my antique boats sport a liquor related title. 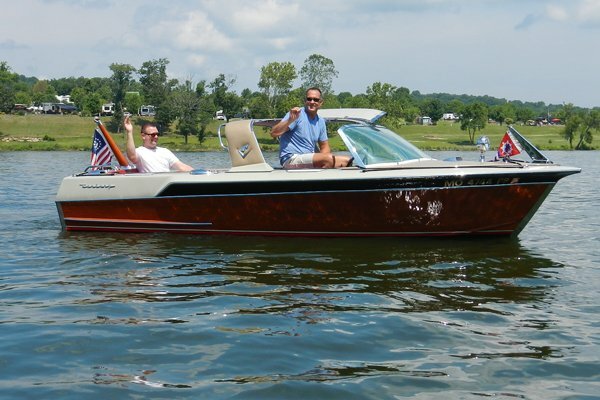 This Riva has been hauled all over the country from its home base in Little Rock, Arkansas to boat shows in Lake Tahoe, Ocean Reef and beyond. Additionally, I have taken cruises on the St. John’s River, Tennessee River and the Upper Mississippi. While Champagne Taste has brought me many trophies and recognition, the biggest reward is to be the owner of such a beautiful treasure. 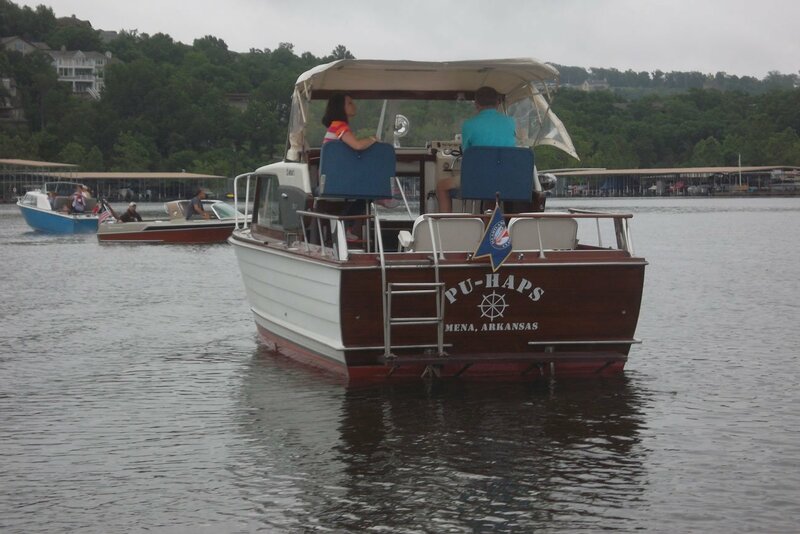 Lucky Debonair was first delivered at Link’s Landing on The Lake of the Ozarks. Link’s Landing was the largest Century dealer in the country. The boat was obtained by the owner as a gift to his daughter. 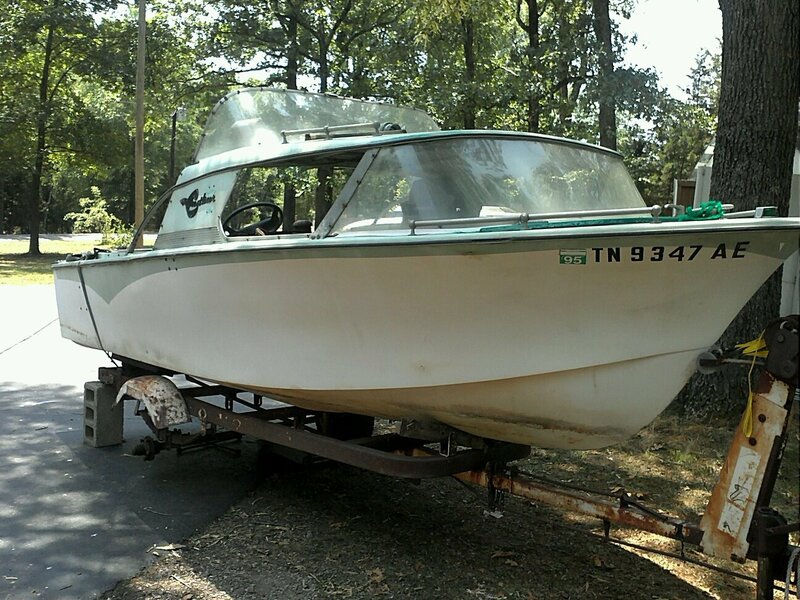 The boat didn’t turn out to be what she had hoped, so my grandfather purchased the boat from the Landing later that year, and it has been in his and my possession ever since. Lucky is made of African mahogany with a fiberglass cap and a gull wing top. We used the boat for many years on local lakes and rivers until it was in disrepair beyond our means. Lucky was stored in various barns, railway bays, and warehouses until 2010 when it made the voyage to Macatawa Bay Boat Works in Douglas, MI where it underwent a 3 year preservation process. Originally the boat had a 352 Ford Interceptor, which unfortunately was in disrepair. We made the painful decision to put modern power in the boat. In its first summer we put 60 hours on the boat, so a cracked block was not an option. We love to use this boat every chance we get. Lucky Debonair was the thoroughbred that won the Kentucky Derby in 1965. The Sabre was part of Century’s thoroughbred fleet. This particular hull number was the first off the line for 1965, and this thoroughbred was the first to cross the finish line, so although it’s not a female name, we couldn’t resist. Lucky spends his time running around on inland lakes, mostly in Missouri, Illinois and Michigan. On a nice calm day, we even venture onto the “big Lake”. Last October we enjoyed a long late weekend on this great host lake, Table Rock! We have a 2 week trip to northern Michigan planned late this summer, with most weekends in between spent on Lake Springfield, IL. 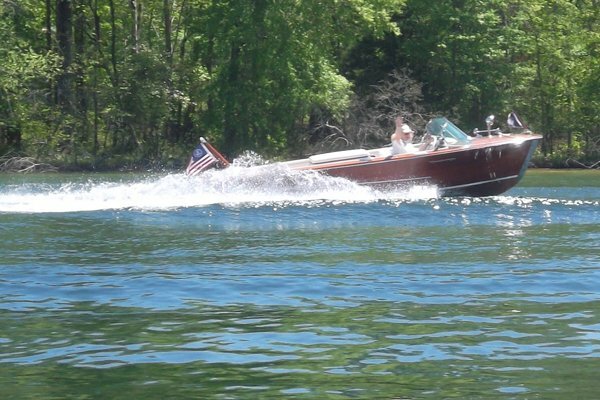 Wood Carver is a lapstrake 17’ Carver Custom Commander. 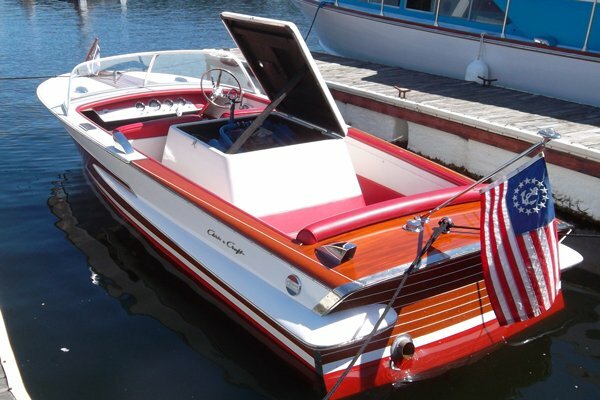 Carver’s lapstrake hulls featured a characteristic soft ride as a result of full length triple laminated oak keelson, pre-shaped solid oak stringers, white oak ribs, double planked oak transom and 3/8” 5-ply marine plywood planking. Carver continues to build boats today, but certainly not of oak and plywood. Wood Carver was previously owned by Blaine and Lisa Waknitz and was restored in 2002 by Mr. Paul Morris of Des Moines, Iowa. Paul and Marge Morris, Heartland Chapter members, are the owners of Cedar Tree, Inc., a central Iowa supplier of marine plywood, epoxy and consulting services. We acquired Wood Carver from Blaine and Lisa in September, 2008. 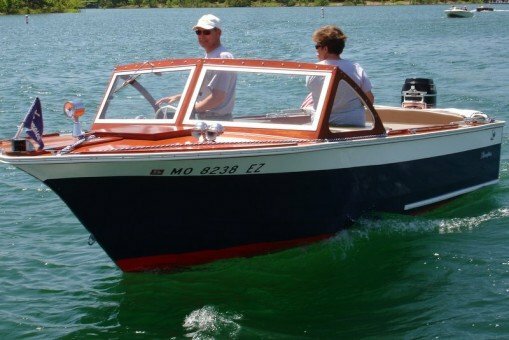 In 2012 Wood Carver received some refreshening and modifications including a new rear seating and storage configuration providing room for a new 18 gallon primary fuel tank, auxiliary fuel tank and storage for life preservers, fenders, dock lines, etc. 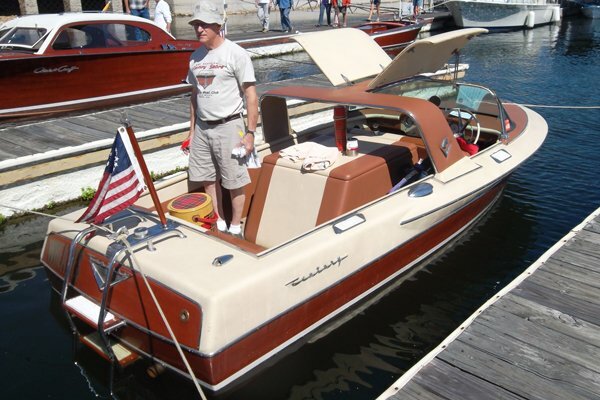 Wood Carver has trailered to numerous classic boating events including Bay Harbor Michigan, Grand Lake Oklahoma, Lake Hamilton, Beaver Lake, and Lake Ouachita Arkansas, Table Rock Lake Missouri, Lake Eustis, Lake Dora, and Lake Harris Florida. 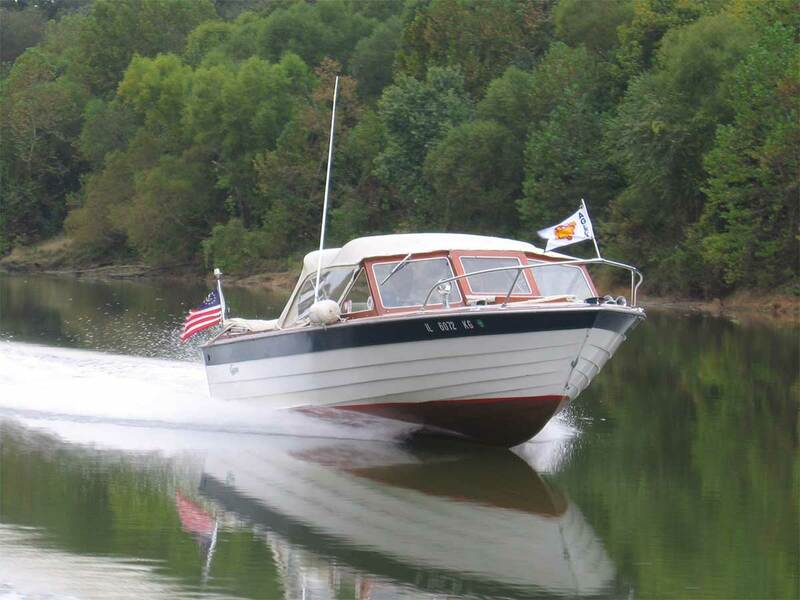 Her home port is Kimberling City, MO and her outboard power allows her to be a “12 month vessel”. 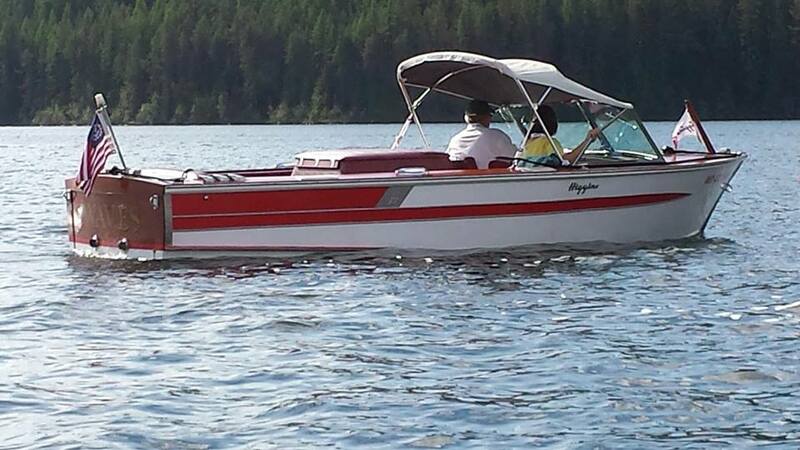 Wave Toucher IV was purchased in the fall of 2014 from ACBS Sunnyland Chapter member Jim Flack, Mt. Dora, Florida. Post-purchase test run was on Lake Dora and the Dora Canal. We did another section of “The Great Loop” in this boat, which replaced the ‘65 Carver, with John and Carolynn Thompson in February, 2015. We intended to run from Mobile Bay to Sarasota Bay. However, when we reached Carrabelle, FL where we had to leave the Intercoastal waterway and travel in the open Gulf of Mexico, we faced high winds and 5’ to 6’ waves. So we had to turn around and return to where we started. We will be doing another section, Chicago to Lake Barkley, Tennessee in September. I seem to be hooked on Lapstrake boats. All of my boats have the word “Toucher” in their name as a follow up to my homebuilt aircraft that were all named “To Touch the Sky”.